Indian millennial consumers are continuously looking at improving their lifestyle by bringing the best products at home in a suitable budget. This dynamic change fosters the growth and development of home furnishing field. With the firm foot in the retail landscape, India offers a wide range of products such as furniture, rugs, floor coverings, furnishing fabrics, table covers and other home furnishing accessories to its consumers. Home furnishing market in India is touted to grow exponentially in the years to come. There are several opportunities existing for entrepreneurs or start ups who wish to enter into this market. The home furnishing industry is greatly influenced by traditional motifs and design, though there are some western element attached to it in terms of styling (use of lace, minimalism etc). Such designs greatly appeal to modern customers who are increasingly adopting a modern lifestyle, but are still attached to their traditional buying temperament. With the change in demands and preferences of consumers over the past decade, the industry has also evolved itself to a whole new level. Concepts like fibers, UV resistant textiles and better colour retention materials have gain importance. Natural fibers have gained popularity due to the renewed interest in eco-friendliness and sustainability. The home textile market has seen an increase in the use of organic fabrics, and textures and weaves that focus on natural fibers. According to “Indian Home Furnishing Market Forecast & Opportunities, 2018", with the increasing textile industry in the country, the furnishing market will continue to flourish. The home furnishing market is anticipated to witness demand from retail industry. By 2018, home furnishing market in India is expected to grow at CAGR of 8 per cent by value to reach $5.29 Billion. 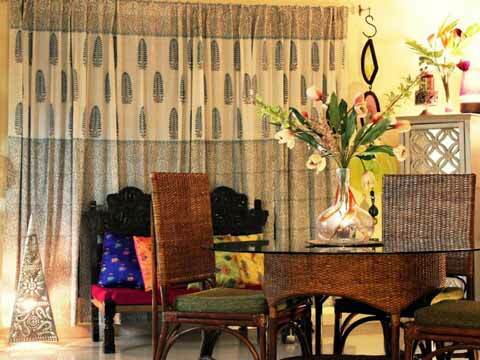 During the same period, curtains &, upholstery and rugs & carpets will grow at CAGR of 8 per cent and 9.4 per cent. After a brief slump in 2009, the home furnishing market is expected to recover in the coming years. The rise in middle-class incomes and an increase in the number of home-specific organized retailing chains in smaller cities will propel growth. Skilled man power is always in short supply. Also a lot of problem retailers are facing is the lack of knowledge of legal metrullogy act. Hence, addressing external forces like legislation and government bodies poses as a great challenge for the industry. Retail market is a turning hot. There some common design strategies that a retailer can employ to offer its wide range of consumers. The market of home furnishing retailing is expected to grow. The domestic market for home furnishing has been increasing due to rise in disposable income and a jump in home furnishing retail chains. The Indian market for home improvement is dominated by unorganised sector due to more brand visibility, varieties and low prices. The segments in home furnishing include bed and bath linen, curtains and upholstery, kitchen linen, blankets, carpets and rugs. In the near future, the market for curtains & upholstery and blankets & rugs will grow at a faster rate.